[23?] how to hash a Calves head. Take a Calvbes head, & boyle it till it be half boyled or rather more, then take up the head, and take one halfe of it & Carbonade it shake a Little Salt over it then wett it over with Yolks of eggs, & set it befor the fire to broyle, when it begins to be brown bast it with butter, then take the other half, & shake it, & put in half a pint or a pinte of oysters, Season it with peper, & Salt & nudmegg. Ifyou will have a browne sauce, take a peece of butter, & put it in your frying pan, & hold it over the fire till it be brown, then put in your hasht meat with some Strong broth & a Little Claret, stew it with a bunch of sweet herbs & a peece of bacon Stuck with Cloves & an Onion you may fry sweet breads & Lamb Stones to put on the top of your broyled meat To make fforst meats for sasages & bals to put amongst it. 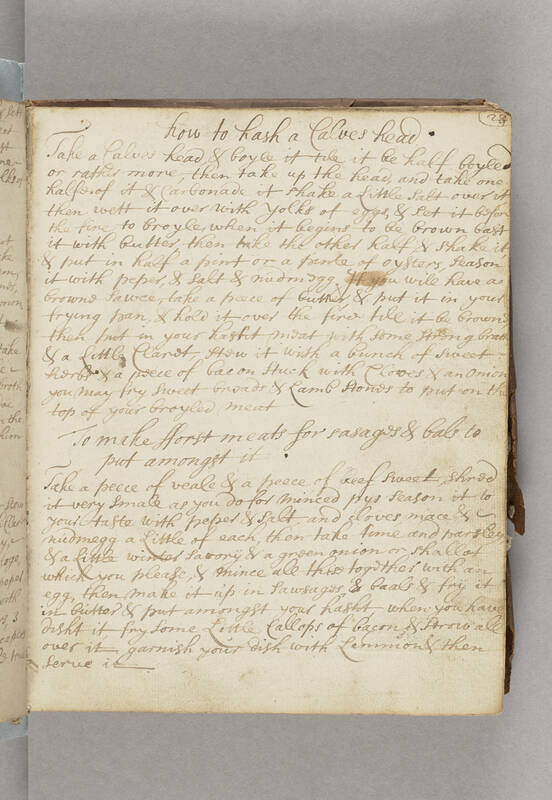 Take a peece of veale & a peece of beef sweet, shred it very Small as you do for minced pys season it to your taste with peper & salt, and cloves, mace & nudmegg a Little of each, then take time and parsley, & a Little winter savory & a green onion or shallot which you please, & mince all these together with an egg, then make it up in Sawsages, & baals & fry it in butter & put amongst your hasht, when you have disht it fry some Little Callops of bacon & [illegible] all over it, garnish your dish with Lemmons & then serve it.